Submitted by Dan Dooré on Wednesday, May 23, 2018 - 13:41. 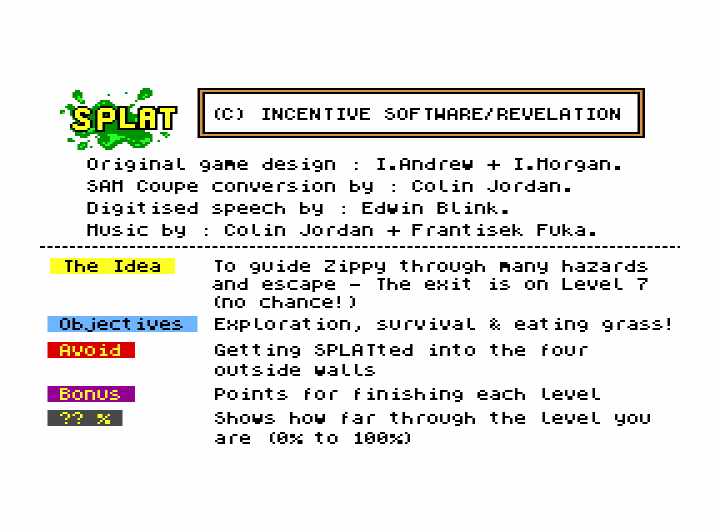 Originally released on the Spectrum, Splat! was another of the addictive SAM game conversions. 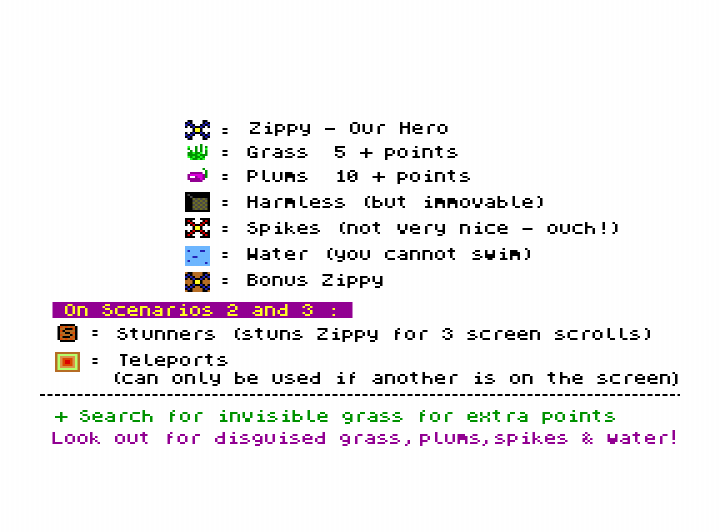 The aim of the game was to control Zippy (via up / down / left / right) and eat the grass growing around the maze. The catch being, the maze itself moves randomly. If you get trapped against a wall, you’re dead! Due to it’s random nature, each play was never the same as the previous one. Aha! A game I can review and explain in about one paragraph. Hurrah! You play the part of a little green blob that has to eat all the greenery and food that he can on a largish map. You can move about the screen as you wish, but impacting on any walls or water results in your immediate death. Meanwhile the screen scrolls away in a set pattern, meaning that you can get trapped in innaccessable places quite easily and you will often have to make speed retreats when the screen suddenly decides to change direction. And that is it. Okay then, 2 paragraphs. Graphics 14% Terrible, but they don’t need to be good. 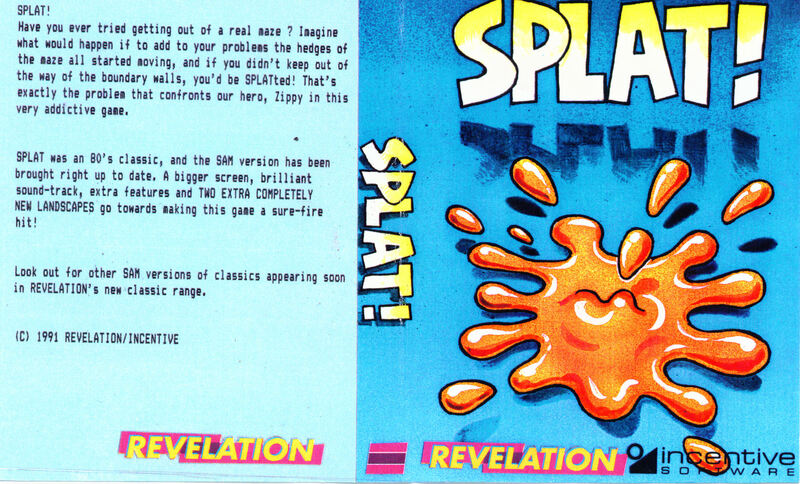 Hardly an improvement on the Speccy original. Addictivity 75% Soooo simple, and playable to boot. But may not last that long. Instant Appeal 93% Easier to get into than a pair of greased pyjamas. Sound 86% Nice tune, and a sampled ‘Yippee!’ at the end of every stage. Overall 78% Easy to become addicted to, but it won’t offer long-term gaming. But at around 4 quid, who cares? 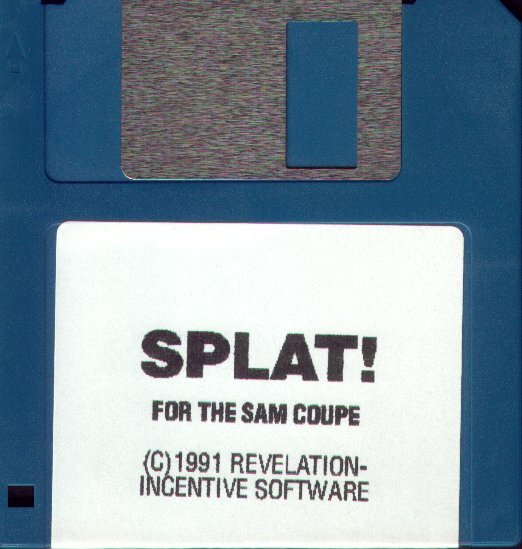 More raiding of the Speccy back-catalogue with this SAM adaptation of the game that launched Incentive. You play Zippy, a sort of sentient 'X', who has to traverse a giant maze eating grass and plums. Hmmm. The big prob is that the maze is moving independently of old Zip, so that you're constantly in danger of being squashed against the walls. Later levels have water traps and stun tiles, but your biggest enemy is always the maze, or rather mazes. Y'see, this version has two completely new and even trickier landscapes thrown in. As regards presentation, there's a jolly, upbeat music track, but the graphics are rubbish. There's no animation and the scrolling is blocky and jerky. To be fair, this was true of the Speccy version, and anyway, in this sort of game the graphics take a back seat to the gameplay. This is old-style sweaty-palm business as you tear around the maze, never quite knowing if you can risk nipping down that corridor to grab those plums. The rough graphics belie the great playability, it really is incredibly addictive. And, as the maze moves pseudo-randomly, it's practically a different game each time. Having said all that, Splat! is a game based on a single idea, and one that can get somewhat repetitive after a surprisingly short time. On the whole a thumbs-up, but you'd do best to give it a try before you buy. Sweetly simple and horribly playable. You may flip over it. Then again you may not.